Oliver continued making more films with Larry Semon and others at Vitograph. He even took time to appear in a few of Vitograph’s feature films including the missing western “The Little Wildcat”. In 1925 he was the farmhand and tin woodsman in Larry Semon’s project of “The Wizard of OZ”. But, this film was no masterpiece like the 1939 MGM classic. Even though it opened with a lot of hype, film goers and critics disliked it. The famous story you and I know was ignored and a dreadful plot written by Semon was used instead. Also cast in the film was Semon’s real-life wife Dorothy Dwan. In 1928, Semon’s health declined and he passed on October 8th of that year. Babe found more work with Arrow pictures, where he worked again with Billy West. The Studio employed another comic named Bobby Ray. One of my favorite films from this period is called “Stick Around” from 1925. In it, Babe was teamed with Ray playing the “Blatz and Blatz” wallpaper hangers. There are many funny sequences as the men tried to work in a sanatarium. I could see how Babe developed a great chemistry with his partners. He learned so much at that point. I own both a 16mm and Super 8mm print of the film. The Super 8 uses the original title “Stick Around”, and it’s a longer version. My 16mm print is a Castle Films release re-titled “The Paperhanger’s Helper”. It opens with “Old Time Movies”. The version runs shorter at about 300 feet with music and sound effects. Babe did more work as a team with Ray, but his work at Arrow was brief. By 1925, Babe was with the Hal Roach studio and became a company player. I had the pleasure of meeting the great man, Hal Roach, at a film convention in California shortly before his passing. Babe’s first film with Roach, which is lost, was “Wild Papa”. He played a country boy with a pistol. Other film appearances were as supporting roles in Charlie Chase and Our Gang comedies. In the 1925 Roach film released thru Pathe’ “Should Soldiers Marry”, Babe had a brief part playing a doctor who examined Clyde Cook. I happened to see a version released on DVD volume 4, which is part of the “Lost films of Laurel and Hardy” collection series. It’s a somewhat deceptive title since many of the films in the collection were never really lost. In this short, Babe examined Cook, then commented on his condition as if he were checking a car. Although brief, Babe’s interaction and facial expressions showed a fine chemistry with Cook. A great sense of comic timing was displayed here too. Best of all, Babe had the funniest line in the movie. He finished the examination and said “He’s perfect. But I ought to operate for the experience”. Another Roach title, “Along Came Auntie” from 1926, starred Glen Tryon, Babe and Vivien Oakland, who later appeared in some Laurel and Hardy shorts such as “Scram!”, “That’s My Wife”, and the feature “Way Out West” as the Sheriff’s wife. 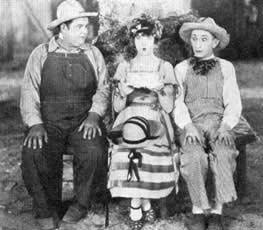 Here she played a woman deep in debt, so she rented a room to her first husband named Vincent Belcher, played by Babe. Her Aunt planned to pass on to her 100,000 dollars and 2 quarts of diamonds, provided she was still married to Babe. But that wasn’t the case. And when Auntie came to visit, Babe had to pretend they were still married. Her then-present husband, played by Tryon, went along with the deception. When introduced in this short, Babe, sporting a bushy mustache, was simply hilarious in my opinion. His emotions were overly passionate as he played crazy with his violin and drum. A scene developed as Babe and Tryon fought and the under-sheriff got involved. In a moment similar to what he would do to James Finlayson in a Laurel and Hardy short, Ollie stuffed a drumstick in Tryon’s mouth. Some Roach films were directed or written by Stan Laurel. Most likely in an effort to just keep working, Oliver made films for other studios like the Fox film company and even Mack Sennett. 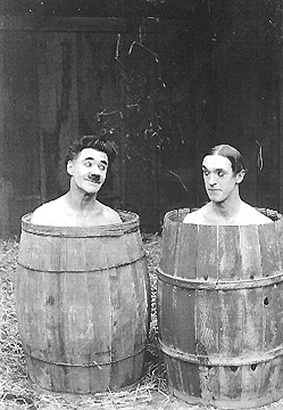 By August 1926, he appeared with Stan Laurel in a short film called “45 Minutes from Hollywood” for Roach, but they didn’t share a scene together. Soon, however, they evolved as a team. By 1927, Laurel and Hardy appeared in short comedies like “The Second Hundred Years” and “Putting The Pants On Phillip”. I just found you thanks to a fellow Son of the Desert. Nice webpage. Do you get the Intratent Journal (voice of the Laurel and Hardy Sons of the Desert)? In my first and second issues (winter and spring 2016) as editor I will share my article “Laurel and Hardy and Semon.” It will coincide with Claudia Sassen’s new book on Semon from McFarland Press. Fascinating and important comedian who worked with both Laurel and Hardy before the Roach years.